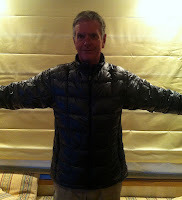 It's arrived - my new Montbell Ultra Light, 800 fill power, goose down jacket. It weighs in at just 225grams. When I say new, I am a little disappointed as I thought this was the newer EX version (that has no pockets or inner zip insulation flap and is 158grams). Note to self read, instruction carefully! I was tossing up waiting for the new 'Plasma" model to be released this month (1000 down fill - same weight as the EX), but at $US225 plus around $US45 shipping it is a bit steep. The EX on Montbell's US website is $US199 (plus shipping), so lets say around $US240. I got this jacket from the NZ online gear company, iClimb for $NZ255 plus $NZ10 shipping. It's 67grams heavier than the EX or plasma, but cheaper. 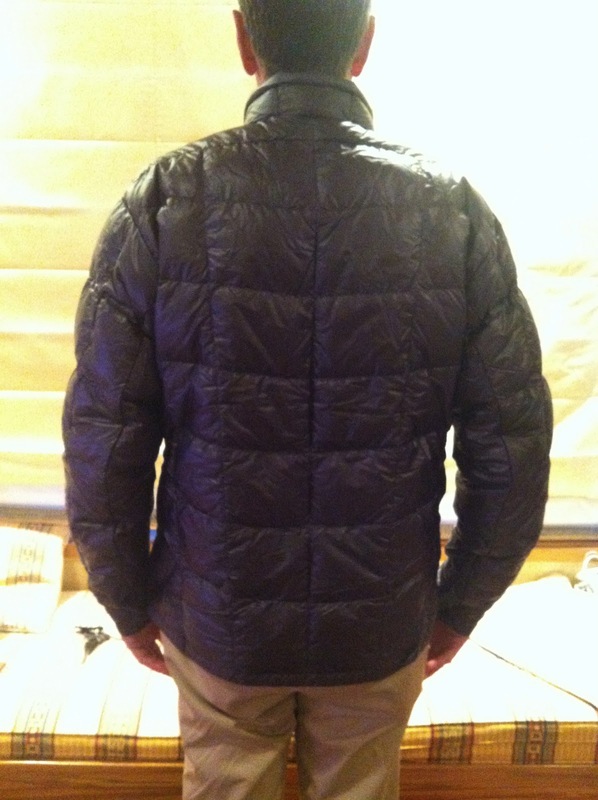 This jacket is specially designed to replace heavy and bulky fleece garments carried by most hikers. I love the way Montbell positions this jacket - "It's what you need when warmth is critical, minimal weight is paramount, and space in your pack is at a premium." Fill - This is the volume that 1oz of down can occupy. The higher the fill power the more insulating value per weight. When using 800 instead of 650 down you get the same thermal capability with an overall lighter garment. Shell - Montbell uses Ballistic Airlight Nylon. One and a half times more abrasion resistant than fabrics of similar weight, while boasting three times the tear strength. They also use Polkatex, an elite water-repellent technology retaining 90% of its water repellency after 100 washes. Ballistic is ultra light and ultra thin and offers high wind resistance performance but feels smooth and silky. Single Quilt Construction - Sew through construction reduces weight while keeping down from migrating (clumping). 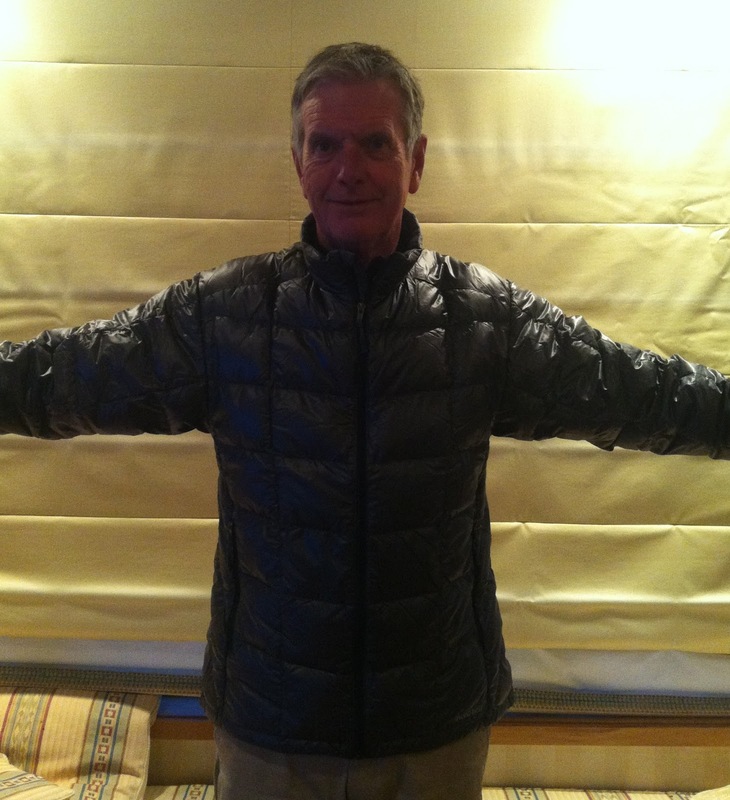 The jacket packs to the size of a soda bottle (pump bottle for us Kiwis). I have included some pictures so you can see fit. I was tossing up between medium and large. I am pleased I went for the latter. This jacket has a fitting style. But in large you can see I have plenty of room to layer underneath. I expect to only need my 200 Icebreaker Merino top (worn under jacket for these shots) under this for 3 season use. Just a fantastic piece of kit. We have some difficulty getting Mont Bell gear in UK. No stockists, so we have all the import duties and vat and extra postage to pay. But for what you have there i think its a bargain price. Something similar from PHD would cost considerably more. Hi Al - understand duty/shipping. I have a friend in the US - I place orders and get them shipped to him (usually free). He unpacks and re packs as a "gift" and mails to me with a suitable "birthday card". He then emails me shipping cost and I drop money into his PayPal account. Re jacket, I goofed a bit - I wanted the EX with no pockets - Oh well it's 45 grams lighter than my current Bozeman Cocoon jacket - expensive weight saving at $5.66 a gram!! Right there with you rob. just picked up the ultralight in store on clearance for NZ$130, packs down so small..
Wayne - That's a good buy! Plasma is very new and not in NZ yet. I think it has only just hit the US market. Re alpine jacket - guess you sub for this in colder conditions? Personally, I just layer up. For example have my base short sleeve merino 150 T-shirt layer on first. 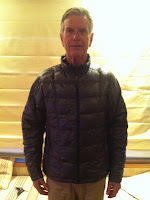 Then I can put on my long sleeve 3/4 zip merino next and to top it off, the Montbell Ultralight down jacket. If I am still cold the rain jacket goes on, but I have never had to resort to that!! I am going to buy the Montbell Tachyon wind jacket when I am in the states. Nice review. The jacket looks like it has a rather relaxed or loose fit on you. I'm afraid L may be too big for me. Can you tell me your weight and height? No, it's no longer made...but I have found a used one...size L. At 5'-11" and 68Kgs (150lbs) though, I'm afraid it will be so loose that it will not be overly efficient. Anyway, thanks for the info! I hadn't thought of tucking the seams...though I too have done the same to a vest. Thanks!